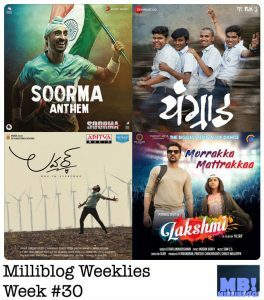 Milliblog Weeklies – JUL01.2018 by Milliblog! So much new music… so much joy! 28 songs this week and Saavn comes closest with 27 songs available! These weekly lists are also a great way to know which of the 3 platforms gets new music the fastest, and usually, all 3 take turns in leading – this week, it’s Saavn! It’s missing just the last song, which is directly from Facebook. Please do check the list below to know the missing songs from YouTube and Apple Music playlists – there’s a lot of unmissable music this week. Title song (Soorma, Hindi): Like Bhaag Milkha Bhaag’s Zinda, but the trio up the ante! This is goosebumps-inducing material! The way they build the tempo, adding the guitar layer with the lines, ‘Zara nazar utha ke’, the ‘Soorma’ hook, the chorus that follows it… everything just adds up so well! Saye, Goth Ramachi (Youngraad, Marathi): Hriday Gattani debut as a film composer is turning out to be very promising. The 2nd song from Youngraad sounds even better! Sung by Shashaa Tirupati and Hriday himself, this is a lovely tune that intersperses a gorgeous chorus to the main melody. The effect is fantastic! In Goth Ramachi, Hriday ropes in Shankar Mahadevan to add to the song’s considerable heft. The tune’s ‘Rang rang’ hook is mesmerizing, interspersed with the slower, softer portions! Adbhutam, Anthe Kada Mari (Lover, Telugu): Lover imports the Bollywood’ish approach of multiple composers (a rarity in Telugu film industry). And it also has only one Telugu composer in that multi-composer mix – Sai Kartheek! The other composers are Arko, Rishi Rich, Ankit Tiwari and Tanishk Bagchi! Incidentally, the songs by Ankit and Tanishk are the soundtrack’s best. Tanishk’s Adbhutam, featuring Jubin Nautiyal and Ranjini Jose has a lovely semi-classical fusion base featuring guitar/mandolin and nadaswaram. The melody is absolutely gorgeous. 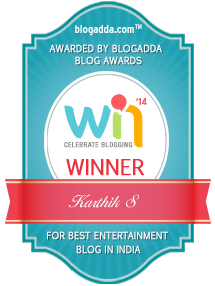 Of the 2 songs by Ankit, Anthe Kada Mari is an easy winner, with its pleasant lilt evoking memories of 80s Hindi film music. Morrakka & Ala ala (Lakshmi, Tamil): Sam C.S. creates a highly melodic dance song that also gets wonderfully rhythmic as it progresses. The highlight of the song is clearly the little girl, Ditya Bhande, and her killer moves. Sam amps up the Madras kuthu sound towards the end and brings the roof down. In the other single from the film, Ala ala, what comes to the fore are 2 things – one, Sam roping in singer-composer couple, Saindhavi and GV Prakash Kumar to sing the song! And two, the splendid work with Cochin Strings *and* Chennai Strings Orchestra… and the effect shows all through the song magnificently! Dhadak (Zingaat, Hindi): Ajay-Atul reuse their cracker of a song, Zingaat, in Hindi. The original’s manic rhythm made for a compelling, highly infectious dance song, and the Hindi song reaches that high to a large extent too… if you haven’t heard the original Marathi song. Connection (OneRepublic): With an anthemic hook (Can I Get A Connection?) that repeats helpfully… very easy-on-the-ear! OneRepublic’s new single from their upcoming album is already a winner. Naked Truth (Mad Love – The Prequel, Sean Paul featuring Jhené Aiko): The best song from Sean Paul’s new album (with 9 songs featuring Sean’s collaboration with the likes of Migos, Dua Lipa, David Guetta and Ellie Goulding!). Sensuous and instantly groovy at the same time. Oru Theepettikkum Venda (Theevandi, Malayalam): Kailas Menon closes the Theevandi soundtrack in style after some impressive numbers released as singles earlier. This time, Anthony Daasan handles the heady title song with his usually ebullient voice, with the music traversing some eclectic sounds. Kadhalikathey, Neeyum Naanum Anbe (Imaikka Nodigal, Tamil): Hiphop Tamizha’s usual brand of music, yet again – it’s almost like a guilty pleasure now, given the repetitive templates. Kadhalikathey makes up for its terrible lyrics with its highly energetic sound on top of what’s essentially a nice gaana song. Neeyum Naanum is an interesting melody where the composers a nice, soaring melody befitting the 3 male singers – Raghu Dixit, Sathyaprakash D, Jithin Raj. Pora Pora (Yaar Ivargal, Tamil): Javed Riaz, who showed considerable promise with his melodies in Maanagaram, scores for Balaji Shaktivel, who has a mighty good track record with his films’ music. Pora Pora impresses with Diwakar’s thoroughly engaging singing, and the percussion + strings combo. Nawabzaade (High Rated Gabru, Hindi): This is T-series optimizing its music library, and if Guru Randhawa is the current blue-eyed boy of the label, can his incredibly popular song be left behind from the film soundtrack scene? Nope. Here it is. Delightfully energetic, as always! Mujhe Chaand Pe Le Chalo (Sanju, Hindi): The 2nd A R Rahman song from Sanju, after Ruby Ruby. I’m tempted to say this is Nikhita Gandhi’s stunning show all the way, but the mysteriously swerving jazz’y and retro tune by Rahman does something to your mind! Raati (Madras Gig, Tamil): The 3rd song from the Madras Gig album… and this one’s by composer Santhosh Dhayanidhi, along with Bamba Bhagya. Dreamy and lilting song with a lovely dash of nadaswaram. This album/effort is turning out to be pretty impressive! Thullimazha (Ennaalum Sarath..?, Malayalam): Ouseppachan pulls off something cheeky in this song – the song’s rhythm is so-obviously modeled on Roja’s Chinna Chinna Aasai, while the first interlude alludes to Ilayaraja’s iconic song from Olanagal, Thumbi Vaa! The tune too, all the while, is wonderfully pleasant, in Swetha Mohan’s charming voice. Minsarey (Vijetha, Telugu): The background score composer of Arjun Reddy gets his own film as music composer. It’s a middling effort, largely, but for this one song that easily stands out. The waltz’y backdrop sets the melody for Karthik very nicely. Mayamanjeleri, Aaranu Nee (My Story, Malayalam): Shaan’s soundtrack for the film is deeply seeped in melodies, barring Pathungi. After Mizhi Mizhi, Shakthisree’s Mayamanjeleri impresses effortlessly, with its wonderful lilt. Aaranu nee is Shaan’s domain all along! A nice mix layering in the very-Bollywood’ish tabla base as a catchy diversion. Laila Oh Laila (Vaasu Naan Pakka Commercial, Kannada): The 3rd song from the film, and Ajaneesh’s tune has a wonderful, frothy early-Rahman style pattern. Sanjith Hegde’s lead vocals go perfectly with the song’s light-hearted feel.